We are a True Value hardware store offering a full selection of farm and hardware supplies including items in lawn and garden, paint, electrical, plumbing, tools, automotive, animal feed and supplies, tack, fencing, and trailer accessories. 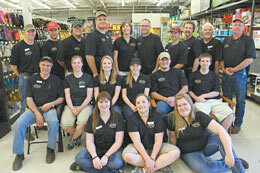 Plus, we carry a full line of work, western and rubber boots and western, work and fashion clothing. We also have a full selection of toys including Breyer, Melissa & Doug, Tonka, and John Deere. We have a unique gift section that includes games, picture frames, decorative signs, candles and more.